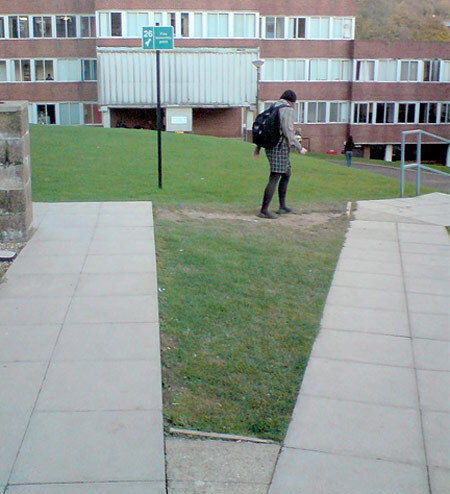 I’ve often wondered about the fate of those spontaneous paths which cut diagonally across rectangular grassy patches. And until I’d discovered the Desire Paths group on Flickr, I didn’t even know that this phenomena even had a name, let alone that other people might be interested enough to catalogue their existence. 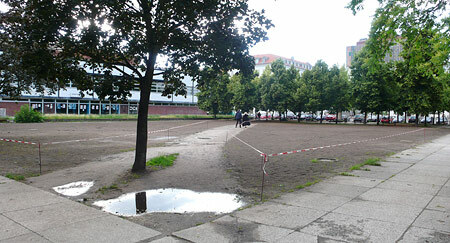 A desire path in the center of Berlin. Recently, a client happened to mention that the empty plot of land next to their building (shown above) was to be turned into a kind of park, and that the desire path already running diagonally through it was to be preserved for a while – amplified evenÂ – in order to determine the course of a future, more permanent footpath. Pretty radical stuff, all things considered. Most urban footpaths seem to have been planned by bureaucrats. The real mistake is that they are planned as formal geometric arrangements, which probably look fine-and-dandy from a hot air balloon, or in the planner’s CAD-program, but mean nothing on the ground. Desire paths are a natural reflection of human behaviour, and are fine examples of ‘swarm-intelligence’, if I might flog a buzz-word for a moment. Even worse than poor planning though is enforced stupidity: I recently saw an entire crew of men in green overalls ‘repairing’ a desire path at tax-payer’s expense. Needless to say, the grass they had busily sewn into freshly turned soil on one day, had been ground to a pulpy mush by countless bicycle wheels by the next day.